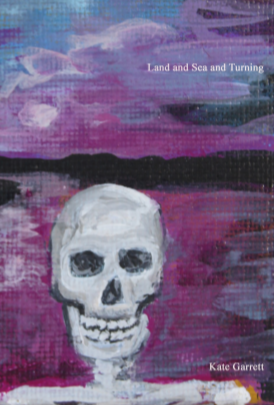 ​Land and Sea and Turning is my most recent chapbook - a limited edition from Cringe-worthy Poets (CWP) Collective Press (published in August 2018). These are poems about free will, destiny, or being knocked around randomly by a cold, uncaring universe. Maybe all three. It depends on who's reading them, really. Cover art is by Mary Lou Springstead, from her Death Out and About series of paintings. US readers can buy directly from the publisher, and readers from the UK and elsewhere can buy signed ones from me - I only have a very few copies left! They are £5 each with varying shipping costs (depending on your country). Email me at mskateybelle@gmail.com to order, and I will give you a total and PayPal details. their lines word-perfect to the king. without a name beneath a castle window. into the unknown, last-minute getaways. "A good indication of the tone of this collection is in the opening poem: 'The Girl in Blue' – the mystery of her death and for sixty years, her unidentified remains. From here, Garrett effortlessly leads us into the worlds of Norse and Greek mythology – inhabited by a monstrous wolf, a vampire; or folkloric tales of runes, herbalism, and even cannibalism. There is no excuse for death, no pussyfooting around; the poem 'Nessus' opens with Deathbeds are hotbeds of apologies and promises, hollow as arrow shafts. There is some humour – of the dark kind associated with morbid and fiendish folk tales. But not all the poems are historical – in 'Mercurial', it is the fear of losing a child in the sea, and the subsequent irony that, when found, '..he knew where he was all along', and there's the enchantment of the spirit-nature of the child in 'Witchling'. The strength of this collection is in the poet's skill of elision, her surety in bringing all these worlds together where ideas are both abstract and concrete merging to form an imaginative whole, a vision of a fantastic world, and all very much alive"
"Kate Garrett has a knack for capturing a moment in history and describing it 'from beneath', or from the inside out. These are poems of survivors, of finding a way through the riddles and storms the world throws at us. Garrett is as much of an everyday mystic as anyone could be, weaving her spellcasting skills into words that summon the imagination as they sink through the skin... slowly. From the opening lines of 'For Josephine' to the closing flash of a hipflask brimming with wisdom, the reader is taken on a journey through myth, urban folklore, and the everyday to peek behind the masks we wear, to overturn the parts we act out to survive. Be ready to dance, waltz, and weave your way through stories of people, places, and the vivid magic of memory." ​ "Poems winding around a schoolgirl, sheets of words wrapping a lonely girl in blue, survival despite the temptation of suicide, these tales of a goddess fallen to earth conflate mortality with sensuality. See, listen, this is what we have on this dusty, wintry, itchy planet. The stories and the words themselves to play with while we wait for the inevitable end, whenever and however it comes for us. Love notes and spells, giving magic to the mundane brutality of everyday, mythologising the dullness of broken reality with the signifiers of ancient religion. I call upon you, Fenrir, I cast the runes of Odin, oh dear winter I need your wings for this journey of blood and bones over the sea of the 21st century. Kate Garrett has written tunes of legend which do not disguise the vicious nightmare of life but make it shimmer. Stay up late with this thought and light the candles."